Last night, I deleted my friendster account. 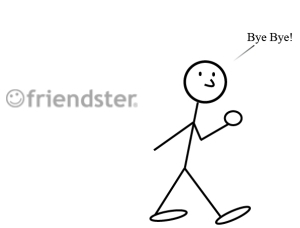 Dont get me wrong, I like friendster. I loved how open it was & I used it as a primary means of sharing details about myself. It is kind of like my personal online profile equipped with all sorts of useful or interesting details about me. My current location, my current thoughts, my latest pictures, my birthday, my education background & all sorts of other details about me. It was also a good place for me to keep in touch with my friends. The comprehensive friendster groups, the birthday reminders, the smiles, the messaging & the testimonials all work well to help me keep in touch with friends who are near & far. But I couldn't take the many stranger friend requests, the constant bulletin board spamming, the picture stealing & the impersonal testimonial images. A good service has been legally abused. And I'm encountering it more & more with each passing day. These shortcomings soon got to me & I had to say that enough was enough. The time has come to put it to a stop. Then, how will I keep in touch with my friends? Well... I have another more 'mature' social networking site. And besides... I got a blog!